Iowa is a great place. That's why I started this web site....to bring together some of the best Iowa has to offer and share it with those who understand how special Iowa is. You'll find works by Iowans, as well as books and DVDs that tell special stories about Iowans. So take a look around, come back often to see new offerings, and support the uniquely Iowa way of life. Through special arrangement with the publisher, you can get two top-selling, award-winning books at a major discount! 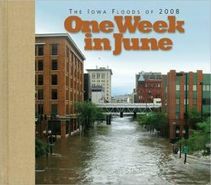 "One Week in June: The Iowa Floods of 2008"
are available for the first time at this special price! a savings of $8.00 if ordered separately! Mike Chapman has spent fifty years of his life in journalism, writing about some of the most interesting figures in American history - from Lincoln to Reagan, from movie stars to Olympic champions. Contained are fascinating, behind-the-scenes stories of such famous people as: Ronald Reagan, Muhammad Ali, Bob Mathias, Lou Thesz, Verne Gagne, Dan Hodge, Dan Gable, Dan Severn, Randy Couture, Bob, Feller, Lou Ferrigno and several movie Tarzans. Prices for all merchandise include Iowa sales tax, unless otherwise noted. Totally Iowa ships merchandise through the United States Postal Service (either First Class or Priority Mail). Copyright 2019 by Totally Iowa. All Rights Reserved.